The QuestCare Clinic was born of the need for healthcare to low-income populations surrounding Watermark Community Church in North Dallas. The 3,900 SF clinic, created as a partnership between QuestCare Foundation and Watermark Church, was designed to provide comprehensive and urgent care services to those who do not have the insurance coverage to receive it elsewhere. Watermark Church and QuestCare Foundation funded the construction and basic operation of the clinic, supporting their respective outreach missions. Open since August of 2013, the clinic’s patient count is trending upwards. Patients come mostly from the immediate surrounding area, one of the most densely populated in Dallas. They also come from other parts of the city, proving that there is demand for quality, inexpensive healthcare services. 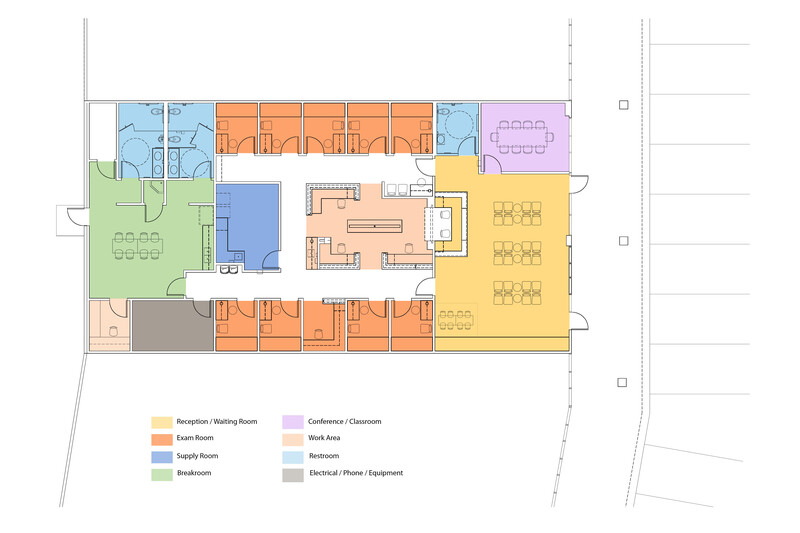 Considering that underserved populations typically have less familiarity with healthcare environments and can be intimidated by institutional spaces, the design approach intended to make the clinic warm, inviting and welcoming. This is reflected not only in the choice of finish materials but also in the organization of the program, from reception area, through triage, and on to exam rooms. A key component of the program is the multi-purpose conference room / classroom adjacent to the waiting room, which serves staff needs (training, conference), and broader community outreach goals (information, education).